Bigger isn’t always better. Photo by powebooktrance. …the report’s conclusions rely on faulty methods of analysis, untenable assumptions, selective use and presentation of data, and a complete lack of peer review. 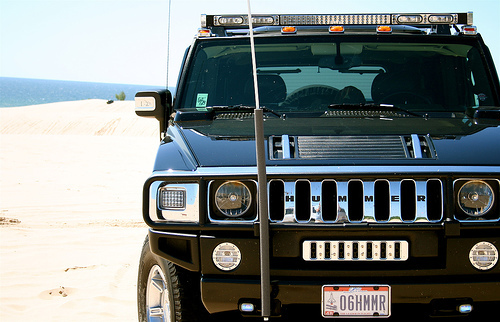 Even the most cursory look reveals serious biases and flaws: the average Hummer H1 is assumed to travel 379,000 miles and last for 35 years, while the average Prius is assumed to last only 109,000 miles over less than 12 years. These selective and unsupported assumptions distort the final results. A quick re-analysis with peer-reviewed data leads to completely opposite conclusions: the life-cycle energy requirements of hybrids and smaller cars are far lower than Hummers and other large SUVs. CNW should either release its full report, including methods, assumptions, and data, or the public should ignore its conclusions. Recently the San Francisco Chronicle picked up Gleick’s work, giving him the attention that he deserves. So the moral of the story is quite simple: Don’t junk your Prius for a Hummer.